Picture this—an emerging social media app with more Millennial followers than leading social platforms, comprised of photos and videos that disappear once viewed. That’s a peek at Snapchat, which is becoming the predominant social storytelling platform. Despite its popularity with the Millennial crowd, many marketers don’t truly understand the big picture on Snapchat. Since it clearly looks like Snapchat has more staying power than its images, marketers need to know how to use this eye-catching channel. 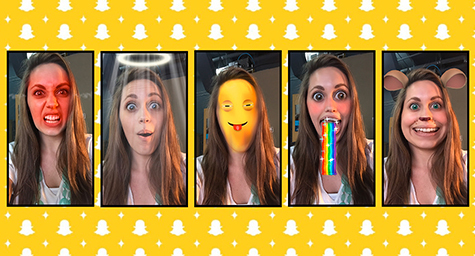 Recently, Socialmediatoday.com shared a look at Snapchat to make marketers snap to attention. Only four years after its arrival on the social media scene, Snapchat already has a higher share of the Millennial market than other social channels. In fact, comScore reported that 71% of Snapchat’s audience is made up of Millennials, which is almost twice the Millennial penetration of Facebook and Twitter. Snapchat’s content is comprised of either Snaps or Snapchat Stories. Snaps are the app’s main content and they include a single picture or video message. Snaps last up to 10 seconds after their initial viewing, unless the user changes the message’s settings. When a series of Snaps are woven together, the result is the app’s other type of content called a Snapchat Story. Users can place multiple Snaps into a single video to tell more of a story with their message. Snapchat Stories last up to 24 hours. Snapchat has been so popular with Millennials because it speaks to their fear of missing out, along with their interest in sharing through stories and need for instant gratification. The disappearing nature of Snaps keeps Millennials rushing and returning to the platform to stay up to date on their friends’ lives through Snaps. Millennials are also drawn to Snapchat because they want to have control over how their lives are seen and shared. With Snaps, these young people are able to present their ideal image. And with Snapchat Stories, users can tie their Snaps together to tell the stories of their lives. Basically, the app is so appealing because it lets users create their identities, and then capture them through their personal lens and convey their lives to the world. Seeing that Snapchat has captured Millennials’ attention, brands want to be on the app to attract that attention. Brands are drawn to its storytelling essence, but want their content to star in the stories. Snapchat divides branded content into Discover or Live Stories features. With Discover, brands can organize and share their own content on the platform. This results in branded content that is sometimes viewed by Millennials as less authentic than organic, peer-produced content. Yet many brands find success with Discover by making their content as genuine as possible. In contrast, Live Stories lets brands showcase user-generated content from people at certain events or locations. Brands combine these user submissions together for everyone to view. They are similar to Snapchat Stories since they last only 24 hours. Not surprisingly, Live Stories are very popular with Millennials because they speak to their fear of missing out and their desire to keep up with peers. In fact, Live Stories are each viewed by an average of 20 million people within their 24-hour life. It’s easy to see why Snapchat is so popular with both Millennials and brands. That’s why marketers need to leverage this leading social media platform before their best opportunities disappear. Keep up with the latest in social media marketing. Contact MDG Advertising.